Hooray! 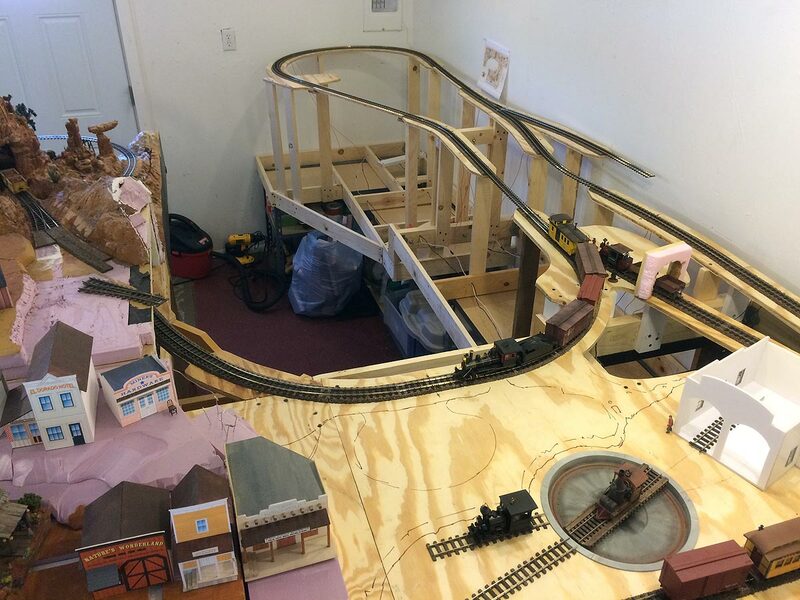 The benchwork, wiring and track is now complete over the entire mainline from San Lorenzo to Thunder Mesa and trains are running! Here's an overhead view from the mocked-up engine service area to the Hanging Rock and Coyote Canyon sections. I'm back from my summer break and just spent the last week finishing up track laying and wiring on the new sections of the layout. 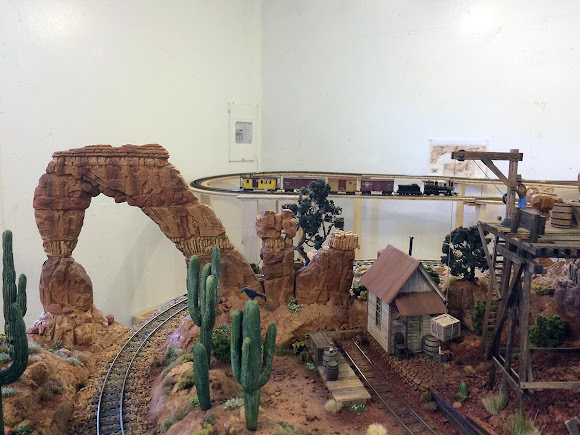 About 30' of Peco On30 flextrack was installed across the Hanging Rock and Coyote Canyon sections, and over 40 soldered connections now bring DCC power to the rails. 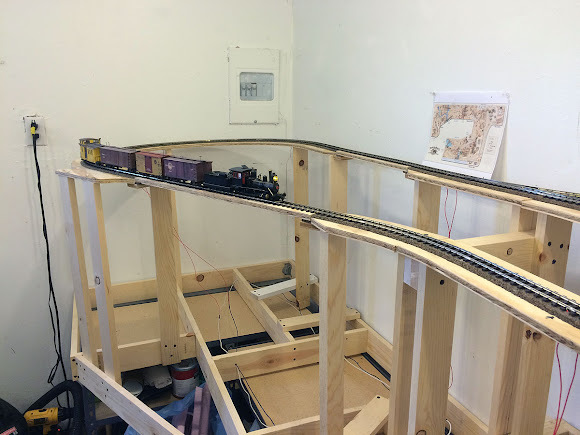 This is a major milestone toward completing the layout expansion and I'm very happy to have it done. Check out this month's video log for more details and a first-ever excursion over the entire mainline! Shiny new rail above Coyote Canyon. The plywood bridges are temporary and can be easily removed. 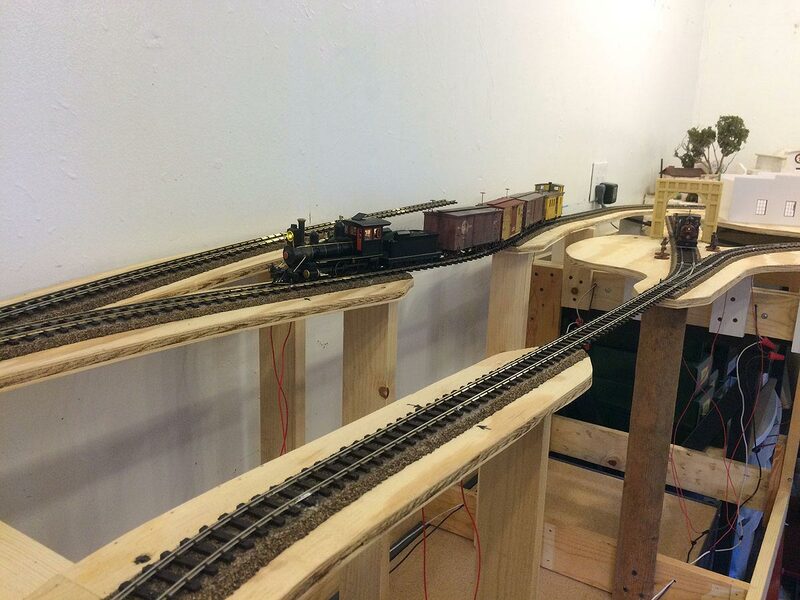 They'll be replaced with detailed models after I decide just what kind of bridges I want here. The 16" radius turn-back curve will be hidden in a tunnel below the portable On18 Calico layout. The breaker box will be hidden behind Calico Mountain itself. Installing an around-the-walls backdrop here is also high on the old to-do list. Here's the Hanging Rock section. Devil's Garden balancing rocks will be at lower left and the whistle stop depot at Hanging Rock will be at right, just before the tunnel portal. In between will be three bridges deep and narrow Horse Thief Canyon. 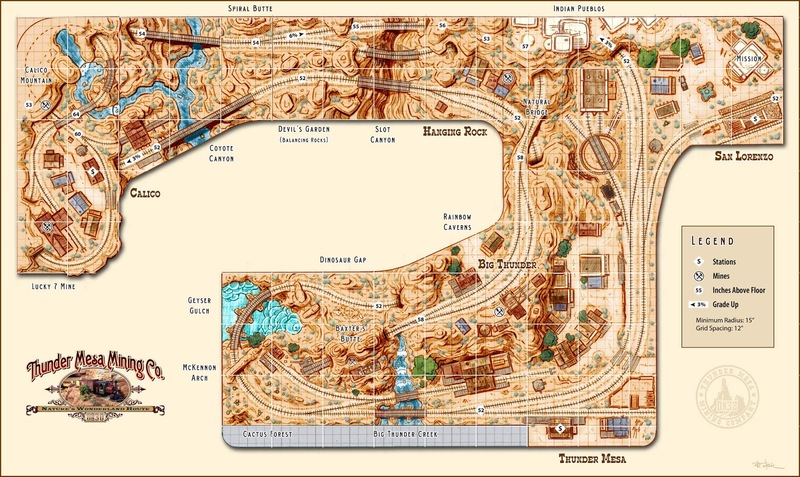 The stub-ended uppermost track is the start of the branchline up to Big Thunder Camp. 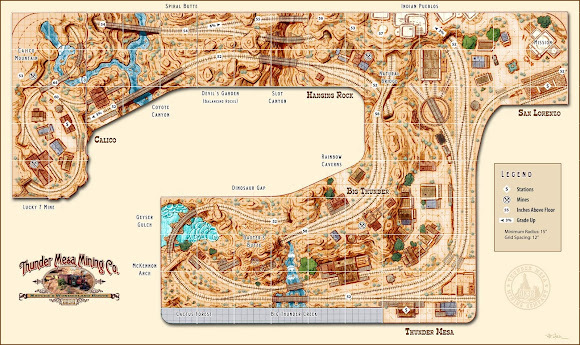 The new Coyote Canyon and Hanging Rock sections are at upper left on the above plan. Sharp eyed viewers might notice that I've already deviated from the plan by swapping the turnout and spur directions at Hanging Rock and San Lorenzo. Things always change during construction and this just made more sense for fluid operations. One thing I'm most excited about is the new sight-lines and deep views that are being created with this expansion. When completed, the canyon scenery in this view will create an unbroken vista nearly 12' deep. Try that on a shelf layout. 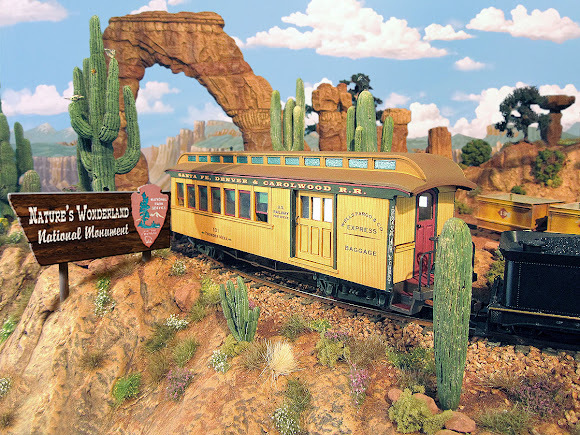 With the mainline track laid and operating well, I'll probably turn my attention to the branchline up to Big Thunder Camp next. I'm also itching to build some scenery and structures and might just dive right in to the scene at Hanging Rock. Time will tell. Thanks for stopping in for a visit, amigos. There's much more to come. Adios for now!